Wiped from politically-acceptable history, the mostly but not entirely Right-wing America First Committee was by some accounts the center of the largest anti-war movement in the history of our civilization. FDR's entry into World War II was not forced by the attack on Pearl Harbor by Japan but driven from years before that by a powerful coalition of pro-war interests. Starting in 1940, the America First Committee fought this coalition in order to keep America at peace amid the rising clamor for battle. They would lose, and after the war be all but erased from public memory. Apollonian: Pallas parallel Sun and ruled by Mercury which is conjunct Sun. The Dionysian/authoritarian side is not nonexistent, but the Apollonian factors are very strong. On "The Axis of Good and Evil" this chart probably lands in the "Libertarian" quadrant, but with a "Statist" lean. This is consistent with the central goal, peace, but also helps explain unfortunate racist leanings in some corners of the membership (along with the Moon/North-Node aspect). Conservative: Moon (probably) conjunct North Node. Assuming the Moon is conjunct the North Node, this helps explain the Right-wing lean of the overall organization, its name, and the racist leanings of some of its membership. 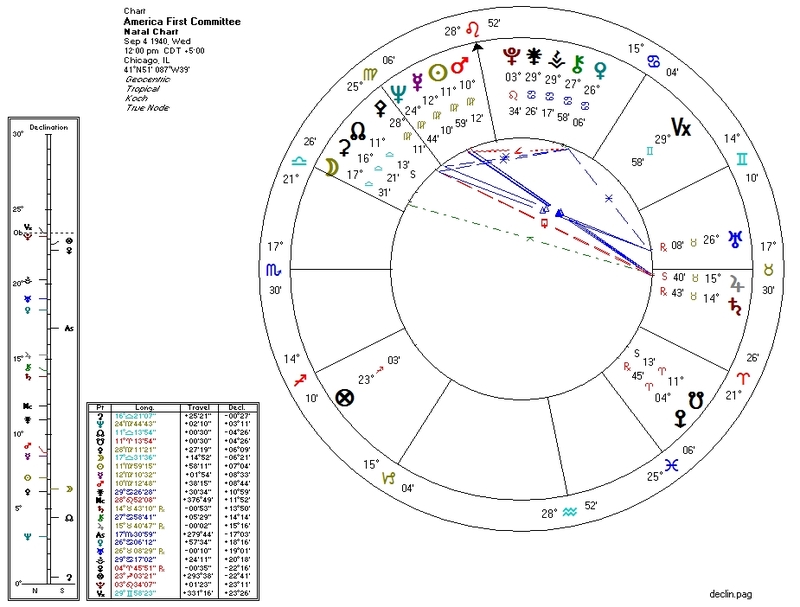 Sun-Mercury-Mars conjunction in Virgo: Battle for a practical end through communication. Jupiter-Saturn conjunction in Taurus: An organization binding together and giving practical direction to numerous ideologies. Pallas conjunct Neptune and trine Uranus: envisioning a new world.